A nice four day weekend is coming up for many of us, and even though Thursday might be busy and Friday is probably a clean-up day, the question is, what will your dog dog this weekend? Aside from sniffing every inch of the kitchen looking for any piece of turkey, stuffing, or bread that may have fallen to the floor, hoping there might be some gravy poured on his food, and begging for some leftovers on Friday, he might need to go and play or meet some new dogs. Doodleromp is planned for Novemeber 26, 2011 from 10am to 12pm at the Broadneck Dog Park in Arnold, MD. It’s free to go and is a local dog park group that hosts doodle play groups. What’s a doodle you ask? A doodle is a mix of a poodle and another dog breed so if you have a labradoodle, goldendoodle, schnoodle, shepadoodle, or aussiedoodle come on out and play! It’s a great chance for your dog to make some new friends as well as you. Broadneck Dog Park is located at 618 Broadneck Road in Arnold, MD. You don’t need to RSVP, just show up with your poodle mix! Don’t forget to bring some baggies to clean up after your dog, some water and a bowl, and maybe a treat or two to reward him for being awesome. If you’re in Uncasville, CT head down to the VFW Post at 91 Raymond Hill Rd between 1pm and 4pm and get your pet’s photo taken with Santa. There is a $5 dollar admission fee and all proceeds benefit the Connecticut Dog House and Tomorrow’s Dog. There will be food, drinks, raffles, and some vendors. The lounge is open for those who are interested in participating in a yappy hour. If you have some used towels that you no longer want, donate them too! Oh, and the picture with Santa… he’ll be on a Harley ready to ride and deliver presents to all good boys, girls, and pets. 4th Annual Island Dog Inc. 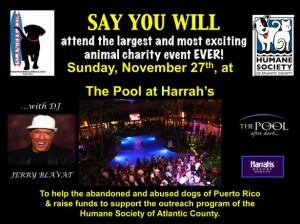 Event is scheduled for November 27, 2011 from 7pm to 11pm at The Pool at Harrah’s Resort. This is an exciting dog charity event in South Jersey in Atlantic City. The money raised from this event will help abandoned and abused dogs from Puerto Rico and support the outreach program of the Humane Society of Atlantic County. Admission is $60 before the event and $75 at the door. There will be music, a cash bar, and food. If you are looking for some TLC, there are also packages available to purchase and they include some extras like a personal wait staff, meet and greet the chef and DJ, as well as having your name or company name published in the press release following the event. For more information and to purchase tickets, go to islanddog.org. Photos courtesy of Annapolis Area Doodles and Island Dog.